“I hold that the Sun is located at the centre of the revolutions of the heavenly orbs and does not change place, and that the Earth rotates on itself and moves around it.” Galileo in a letter to the Grand Duchess of Tuscany, Christina of Lorraine (1616). Galileo, usually referred to by his first name only, was a brilliant scientist and astronomer. He also built scientific instruments such as a telescope and the geometric and military compass which became the most widely known computing device until the arrival of the slide rule. His astronomical discoveries disagreed with the thinking of the Church in Rome, causing his books to be banned and himself placed under house arrest. Galileo Galilei was born in the town of Pisa in Italy on February 15, 1564. He was the first child of Vincenco Galilei, a music teacher, and Giulia Ammannat. In 1572, the Galilei family, including Galileo’s two younger sisters, moved to Florence where father Vincenco had been born. Galileo remained behind in Pisa and stayed with a relative of his mother. Two years later, at age ten, he joined his family in Florence and was tutored there by Jacopo Borhini. Later he continued his education in the Camaldolese Monastery in nearby Vallombrosa. The monastic life appealed to the young Galileo and he became a novice as he intended to join the Order. However, his father had other plans for him and wanted him to become a medical doctor, so he asked his son to return to Florence where he continued his studies. In 1581, Galileo was enrolled at the University of Pisa to study Medicine, but he soon found that his real interest was not in medicine but in mathematics and physics. In 1583, he invited one of his guest lecturers, the mathematician Ostilio Rici, to his home in Florence to speak to his father. Maybe he could be persuaded to let Galileo change his studies to mathematics. His father partially agreed: Galileo would stay enrolled in medicine but was allowed to study mathematics as well. Two years later he left Pisa and gave up his medical studies altogether. In 1585, Galileo started teaching mathematics in Florence and Sienna. In 1586 he wrote his first scientific work La Balancitta (“The little balance”) in which he described finding the relative densities of substances by using a balance. In 1589, he was appointed to teach mathematics at the University of Pisa. When his father died in 1591, it became Galileo’s responsibility to look after his family. This included having enough funds to provide his two younger sisters with a possible dowry. 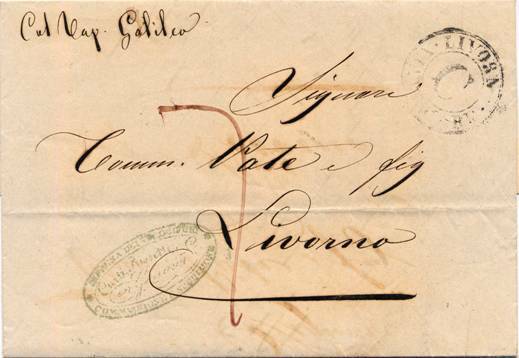 It forced Galileo to look for a better paying position, which he found as professor of mathematics at the University of Padua – it paid three times as much. Galileo lectured at the University of Padua from 1592 to 1610 where he taught Euclid’s geometry and astronomy – the latter still being geocentric. At Padua he had a long-term relationship with Maria Gamba who gave him two daughters and one son; however, they never married. 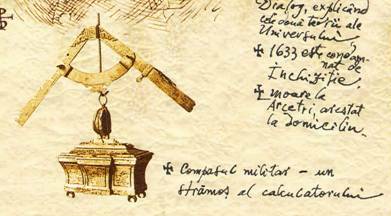 While in Padua he developed several mathematical instruments, one of which was a calculating device which he called a “geometric and military compass” (see below for more details). In 1609 he received information that a Dutchman had invented a spyglass to observe far away objects as from nearby (this was Hans Lippershey who had failed to obtain a patent for his invention). Galileo was highly intrigued and decided to build such an apparatus himself. His first attempt resulted in a 4x magnification. To improve this he decided to grind and polish his own lenses with mathematical precision. In August 1609 he had constructed a telescope with an 8x magnification and showed it to the Senate in Venice. That same year he started studying the night sky and made some remarkable discoveries: mountains on the Moon, the Milky Way consisted of stars, Jupiter had four orbiting moons. 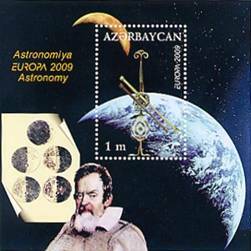 He had observed enough details of the Moon to enable him to make a drawing of the moon’s landscape (shown on the Azerbeidjan stamp). One of his biographers stated: “In about two months, December and January, he made more discoveries that changed the world than anyone has ever made before or since.” Galileo published his findings in Sidereus Nuncius (“Starry Messenger”) in May 1610. The book caused a sensation, not only because of the new discoveries but also because it advocated the heliocentric view of the universe. Galileo sent a copy of his book together with one of his telescopes to the Grand Duke of Tuscany, Cosimo de Medici. It resulted in him resigning from the University of Padua and becoming Chief Mathematician at the University of Pisa and “Mathematician and Philosopher” to the Grand Duke of Tuscany. In 1610 Galileo observed that Venus showed phases, similar to the Moon. Already in 1543 Copernicus had presented his theory explaining that the Earth and the other planets orbited around the Sun. This Copernican or heliocentric system was diametrically opposed to the Roman Catholic Church’s teaching of the geocentric system with the Earth being the centre of the universe around which all planets orbit. It put Galileo on a collision course with the Church. In 1616, Pope Paul V ordered the cardinals of the Inquisition to conduct an investigation of the Copernican theory. They concluded that the theory was false and Copernicus’ De revolutionibus orbium coelstium (“On the Revolution of Heavenly Spheres”) was listed on the Church’s Index (of banned literature). Galileo was informed that he was forbidden to hold or promote these views. When a new pope was elected in 1623, Pope Urban VIII – an admirer of Galileo, Galileo dedicated his new book Il Saggiatore (“The Assayer”) to the new pope. After meeting the pope a few times, Galileo believed that the Church would not take strong action on his views. In 1632, he published his Dialogo sopra i due massimi sistemi del mondo, tolemaico e copernicano (“Dialogue concerning the Two Main Systems of the World – Ptolemaic and Copernican”). The Church reacted by putting the publication on the Index – thus banning it – and ordering Galileo to appear before the Inquisition. Due to his ill health this only happened in 1633. During the trial, Galileo was found guilty of heresy, had to recant his views and was convicted to what amounted to house-arrest – normally the penalty for heresy was imprisonment, but this lighter sentence was probably due to his age, deteriorating health and scientific reputation. He was allowed to return to his home in Arcetri where he lived until his death under the watchful eyes of officers of the Inquisition. In 1638 he completed his Discorsi e dimonstrazioni matematiche intorno à due nuone scienze (“Discourses and mathematical demonstrations concerning the two new sciences”) in which he explained the basics of mechanics, such as gravity, impetus, why the trajectory of a thrown object is parabolic, speed and acceleration. Unable to publish this mathematical work in Italy, the manuscript was smuggled to Leiden in the Netherlands where it was published that same year. Galileo Galilei died in Arcetri on January 8, 1642. Because of his conviction for heresy, his family could not bury him in the family tomb in the Basilica of Santa Croce, so they concealed the body. It would be nearly one hundred years later, in 1737, that Galileo was entombed in the church by the civil authorities. In 1992, 350 years after his death, Pope John Paul II publicly admitted that the Catholic Church and its theological advisors had made errors in his case. However, no apologies were offered; nor was it stated that the Church had been wrong at the time. The Galileo case was closed. 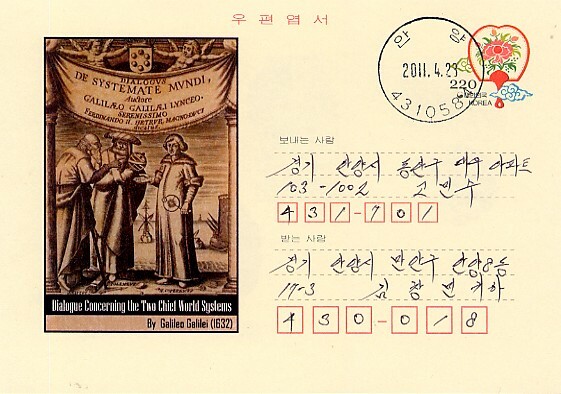 Galileo’s geometric and military compass as shown in the margin of the Romanian 2009 Astronomy sheetlet. In 1597 Galileo starting constructing small calculating instruments – basically sectors but he called them compasses – to assist the military, because their use of firearms and cannons called for increasingly mathematical knowledge. The brass instrument consisted of two rulers of equal length which were joined by a hinge. These two arms were engraved with numerous scales. Between the arms was a quadrant, also with various scales, which was affixed to the arms by wing nuts. At the end of an arm was a curved clamp that enabled the compass to function as a gunner’s quadrant. The instrument quickly and accurately solved a wide variety of mathematical problems: proportionality, trigonometric calculations, multiplication and division, square and cube root, comparison of areas and volumes, currency exchange rates, calculating interest and various basic military problems. To satisfy a growing demand, Galileo had set up a small factory with his personal instrument maker Marc’Antonio Mazzoleni. The computing device was easy to use with minimal instructions and became an immediate success. This resulted in plagiarizing with several people claiming ownership of the idea. This forced Galileo to write a letter on the 10th of July, 1606, to the Grand Duke Cosimo de Medici of Tuscany to claim the invention as his own. The letter was accompanied by his explanatory booklet La Operazione del Compasso Geometrico et Militare (“The Operations of the Geometric and Military Compass”) as well as a complimentary example of his compass. The instrument became the major computing device until the nineteenth century when it was gradually replaced by the slide rule. Justus Sustermans (circa 1636), in the Galleria degli Uflizi in Florence. When United Nations Resolution 62/200 of December 19, 2007, declared the year 2009 to be the “International Year of Astronomy”, it also marked the 400th Anniversary of the first use of the astronomic telescope by Galileo in 1609 in Venice. 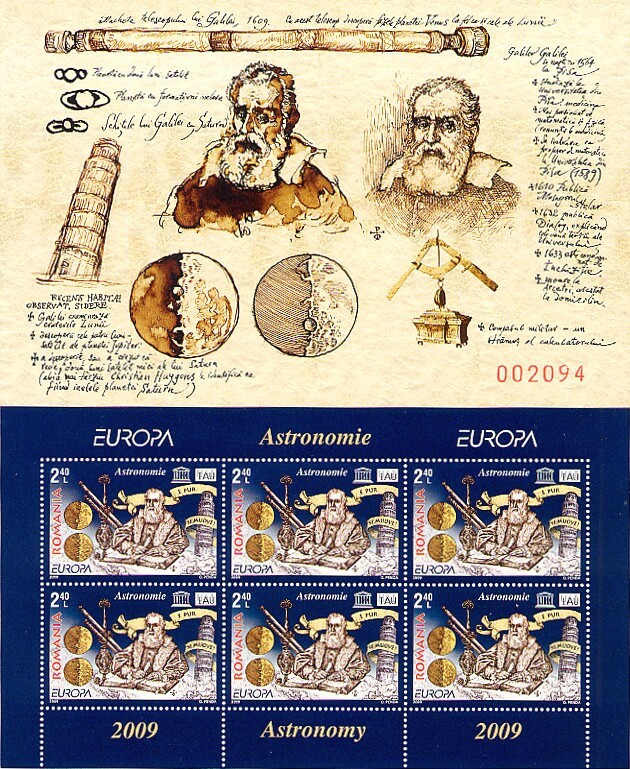 The Association of European Postal Operators thus made “Astronomy” the subject for its annual “Europa” series of stamps. 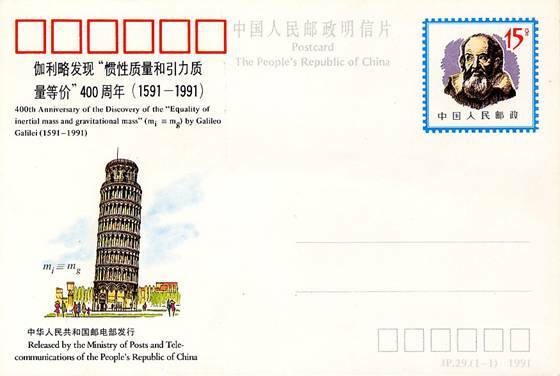 As a result [and also the reason for postponing the writing of this article to 2010], a flurry of stamp issues appeared worldwide commemorating IYA 2009, often featuring Galileo and/or his famous telescope. 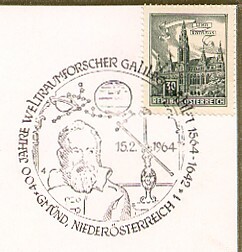 Although Vatican City participated in Europe’s Astronomy issue, its two stamps did not portray Galileo. “Galileo, perhaps more than any other single person, was responsible for the birth of modern science. – Stephen Hawking in his “A Brief History of Time: From The Big Bang to Black Holes (1990). Model of Galilei telescope, 1609. With this telescope he discovers the phases of the planet Venus and of the Moon. Model of Galilei representing Saturn. Discovers the four moons – satellite of planet Jupiter. 1633 Is convicted by the Inquisition. Dies at Arcetri, imprisoned at his domicile.